Zensah is an American compression gear company, based out of South Florida. Zensah’s name is a derivation of the Italian word, senza, which means without. As a manufacturer of compression gear, Zensah is dedicated to making athletic gear that enhances performance and improves comfort during exercise. Zensah’s claim to fame is their ergonomic design, which supposedly puts them above the competition in terms of functionality and comfort. The company is especially devoted to its clients; they stand behind all their products and invite any dissatisfied customer to call to have their complaints addressed. Following are descriptions of four of Zensah’s top products. I’ll discuss the pros, cons, and key features of each product. Enjoy! Similar to kinesiology tape, leg sleeves are worn by athletes looking to relieve shin splints, sore muscles and other forms of wear and tear from exercise. Don’t get the idea that these things are just for runners; they’re popular with basketball and baseball players too. These leg sleeves are one foot long and cover most of the calf. The particular fabric used by Zensah wicks sweat away from your legs to keep them dry and comfortable while you work out. Key features of these leg sleeves include seamless gradient compression; wide ribbing for calf support; and breathable, moisture-wicking fabric. Zensah’s base layer compression shorts appeal to a wider audience than their leg sleeves. No matter how casual an athlete, everyone can appreciate the importance of supportive shorts during a workout. Wearing compression shorts can help to reduce chafing and make you more comfortable in general, too. 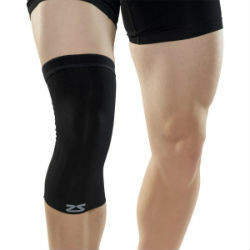 Other functions include leg muscle stabilization and anti-bacterial fabric. These compression shorts aren’t very tight; they’re more like really supportive underwear than spandex. As such, they’re definitely meant for wear under shorts or pants during a workout. If you’re looking for something tighter or that offers more compression, try a different model. These shorts are composed of polyamide and elastane. They have an eight-inch inseam, which provides complete leg coverage. Thankfully, they’re made of the material that resists odor and wicks sweat away from the skin–great qualities in a pair of underwear. You’ve probably seen knee braces before. If you’re an athlete, chances are you’ve probably worn one too. This is basically the same idea, but more geared to preventing injuries than recovering from serious ones. The basic idea of these is that by stabilizing the ligaments in the knee, you can prevent a good deal of injury to them. Zensah does this by specifically targeting the patella with raised ribbing compression technology and stabilizing the knee with a silicone grip. Sizing is pretty simple: measure around the center of your knee. Small to mediums are 13 to 15 inches around; large to extra larges are fifteen and greater. Be sure to measure correctly; compression gear that’s too loose won’t be effective, while compression gear that’s too tight will possibly do more harm than good. Compression socks are great for athletes, people who work on their feet, or anyone looking for a more comfortable and supportive sock. They can help relieve varicose veins, swelling and edema, and other health-related problems associated with blood flow. Just remember: they aren’t medical cures for anything; they simply address the symptoms of some medical conditions. Zensah’s compression socks are made with graduated compression, which is stronger in the ankle and weaker in the calf area. The reason they build them this way is to encourage blood flow up the leg and prevent blood from pooling in the feet. It also helps your leg muscles maintain higher levels of performance and recover from workouts faster. Key features of these socks include: an elastic band around the foot for a tighter fit; a blended composition of polyamide and elastane; and a 200 needle count construction. Not only does this help to stop existing injuries from getting worse, it helps prevent new injuries and micro tears from forming. According to the manufacturer, the chevron ribbing provides additional support that is more effective at preventing injury. 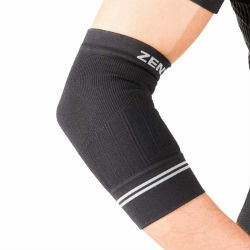 Zensah claims that their elbow sleeve is specially crafted to provide the widest range of motion available. Furthermore, the sleeve is lightweight and, like all compression gear from Zensah, moisture wicking. Sleeves are unisex and sized small, medium, and large. Unlike other compression gear, elbow sleeves should not be worn at night. Zensah products are a little more expensive than some of the other alternatives out there, so if you’re not big into brand names, you might want to try looking elsewhere for a cheaper alternative. Ultimately, they are good, quality products that can help make your workouts easier and more fun. Well, that about does it for this roundup of Zensah compression products. I hope you enjoyed it and maybe even learned a thing or two!